PACKAGE “VITAL ENERGY” Renew your energy in one of the most beautiful places of Italy: Lake Garda, between Milan and Venice. In one of the most beautiful places in Italy, a package designed to give an answer to people like you, who need to renew their energy after a long day at the Expo of Milan. Poiano Resort of Lake Garda, surrounded by 60 hectares of greenery, it' perfect, for those, who come to Milan's Expo and want to see the enchanting magic of the Italian landscapes. Half way between Milan and Venice, and near to Verona, Poiano Resort has an enviable position at the crossroads of the principal transport links. Poiano Resort offers a number of ways to unwind: La Spa (with swimming pool with salt water, turkish bath, sauna, biosauna, emotional showers and massages), Olympic size swimming pool, 6 tennis clay courts, artificial 5-a-side football pitch, beach volleyball, archery, fitness center, children's playground. - 1 night for 2 people in Panorama room. - Transfer on arrival and departure from the Peschiera del Garda train station. (salt water pool, sauna, hammam, emotional showers). - Kit Spa (bathrobe, towel and slippers). - 1 dermosomatic massage for the energetic balance of the entire body (50 minutes per person). Perfect accommodation for couples or families, for meetings or group travels, for celebrations or simply to spend a charming break in complete tranquillity. Surrounded by 60 hectares of Mediterranean greenery, Poiano Resort offers a number of ways to unwind: La Spa (swimming pool with salt water, turkish bath, sauna, biosauna and emotional showers), Olympic size swimming pool, 6 tennis clay courts, artificial 5-a-side football pitch, beach volley, archery, fitness center, children's playground. Set in the breathtaking valley of Lake Garda, sheltered by San Vigilio and La Rocca on either side, stands the Poiano Resort. On the east bank of Lake Garda, Poiano Resort boasts an enviable position at the crossroads of main transport links: airports, motorways and railway stations make it easily reachable. 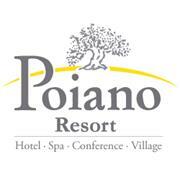 Complex of numerous buildings that blend subtly with their natural surroundings in a climate of total tranquillity, Poiano Hotel is an expansive 4-star hotel surrounded by well maintained gardens and driveways. The 160 Poiano Apartments, housed in six independent blocks of flats and characterised by various architectural styles, are divided into residences on two or three levels. The Conference Centre, located in an independent building inside the Poiano Hotel park, is distributed over 3 floors. Some of the meeting rooms face out over the gulf of Lake Garda. Poiano La Spa, modern and cosy, with a wonderful view of Lake Garda, it’s a haven of calm and serenity where the aesthetic tradition blends with modern technology to make each treatment a unique experience. Olympic size swimming pool (50m x 25m), offering a panoramic view over Lake Garda and furnished with sun beds, chairs and parasols, 6 red clay tennis courts (4 with floodlit) and private tennis lessons, artificial five-a-side football pitch (40m x 25m), beach volley ball court, fully equipped fitness center with personal trainer, bicycle hire, archery, ping pong, acquagym, playground, miniclub. Also perfect for organised travel groups, Poiano offers capacious dining rooms and bars, ample parking with space for coaches, fine cuisine, a competent reception service.